What’s a girl to do when her college roommate gives her four bottles of good Raspberry Syrup? Why, create a recipe using the syrup and WINE, of course! Armed with the fore-mentioned syrup, I decided to play in the kitchen today. I didn’t want to waste the syrup, so I thought I’d make a simple reduction of the syrup and red wine that would drizzle nicely over desserts. While my end product didn’t exactly meet my expectations, it definitely wasn’t a total loss… I ended up with Raspberry Wine Candies! I decided to start small… I poured 1/2 cup raspberry syrup and 1 cup red wine into a small saute’ pan and allowed this mixture to simmer for awhile. Note: I used Boordy Vineyard’s Chambourcin Merlot for this recipe, but I could have easily used James River Cellars’ Meritage… I just had an extra bottle of the Bo ordy wine and wanted to use it up. I allowed this syrup/wine mixture to simmer for about 30-45 minutes – I wasn’t paying close attention to the clock and I was simply cooking the mixture until it reduced significantly and started to look “thick”. Once the mixture had cooked down to the look of a heavy syrup, I added a dash of salt and a teaspoon of margarine. I stirred these two additions into the mixture and allowed it to simmer a little longer. At this point, I probably should have removed it from the stove and used it as a drizzle for pound cake or ice cream. Instead, I continued to cook it until it was even thicker and looked as if a spoon could leave a trail down the center of the pan. I removed the confection from the stove and poured it into the Pyrex measuring cup (as seen in photo) to find that the entire mixture had reduced from 1 1/2 cups of liquid to a scant 1/2 cup of confection. It tasted lovely, but I had no idea what to do with it… so I popped it into the fridge. An hour in the fridge allowed this recipe to thicken so much that I could manhandle a small spoonful onto a piece of waxed paper and eventually eat it as a soft taffy… hence the recipe’s name. I’ve never intentionally made taffy before, but this is what I thought of when I tasted it. Next time, I’ll stop cooking this mixture earlier and allow it to cool so it can be used as a flavorful topping for ice cream or pound cake (as I mentioned before)… but maybe not. It’s kind of fun to create something totally unexpected! Here’s to the unexpected sweetness of life… may we all create more of it to share with others! 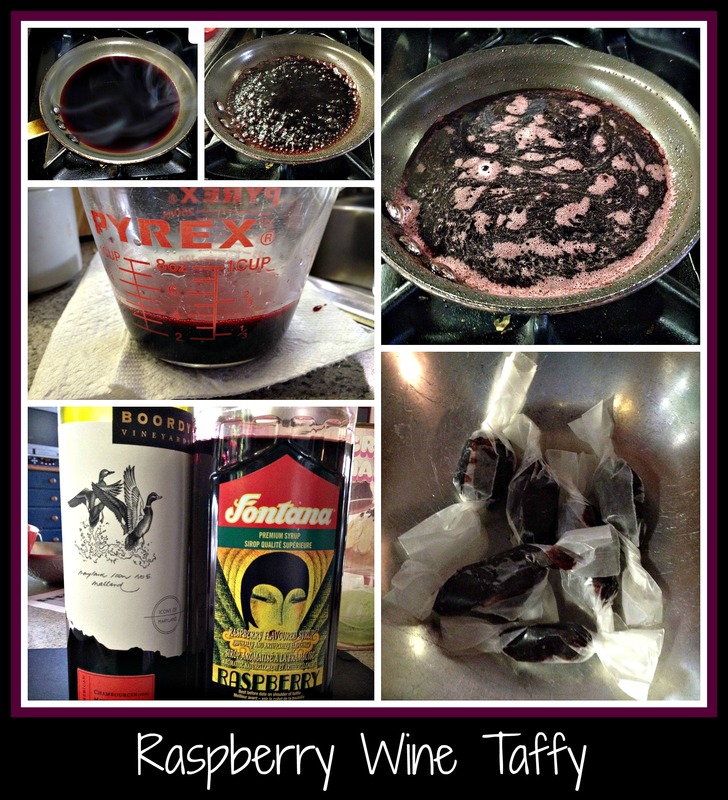 This entry was posted in Cooking, Life, Recipe, Wine and tagged Boordy Vineyard, Chambourcin, confection, dessert, dessert topping, James River Cellars Meritage, Merlot, Raspberry, raspberry syrup, red wine, taffy.